We’ve all witnessed true enthusiasm in a child. Just watch a young boy or girl encounter any experience anyplace. Kids live in the here and now, where every moment brings wonder, curiosity and joy. And boy, do they show it. They jump. Giggle. Squeal. Touch. Sing. Spin around. Dance. They don’t care what people think of them, don’t know that it matters. As a child, I shared that same enthusiasm. So did you. If we can touch the spark still inside of us and live in the moment, even for a moment… knowing that there is a future ahead and responsibilities now and in that future… if we can do this, then maybe that childlike spirit hiding inside will come out and play. It wants to, has been waiting for such a long time to experience the joy and magic, that bit of genius that is uniquely yours and mine. 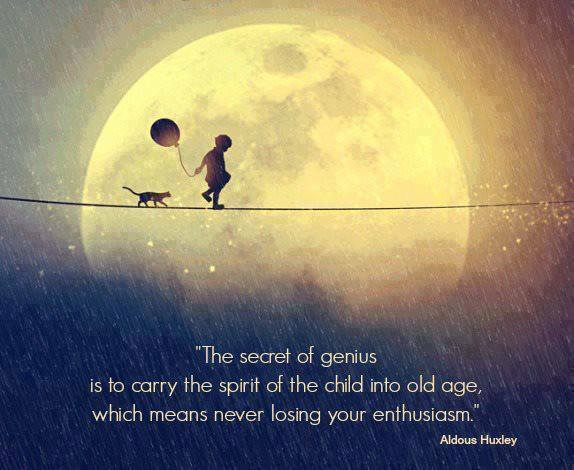 Will you join me in letting your child spirit come out and play? This entry was posted in Hump-day Wednesday and tagged child, enthusiasm, genius, joy, jump, prodigy, wonder. Bookmark the permalink.